Celebrate the season with the flavors of springtime. 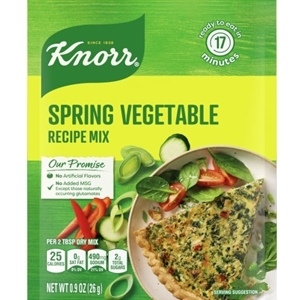 Knorr Spring Vegetable Recipe Mix is loaded with carrots, leeks, zucchini, onions, mushrooms and red bell peppers. 0.9 ounce. Reduce heat to low and simmer, about 10 minutes. May contain milk. May contain sulfites.